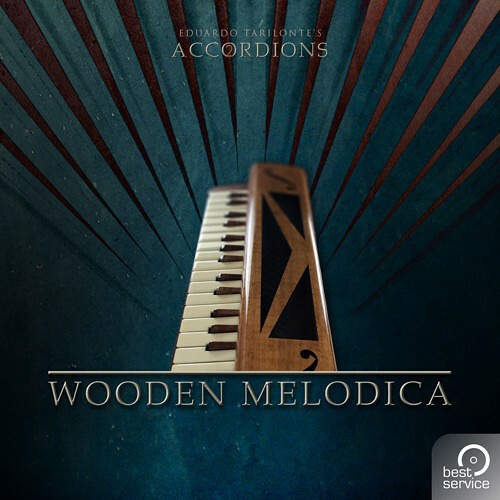 Created by award-winning sample library developer Eduardo Tarilonte, Best Service Accordions 2 - Single Wooden Melodica is a virtual instrument plug-in designed for composers, arrangers, and producers looking for an authentically realistic and playable wooden melodica with expressiveness, well suited for film scores, games, pop, or dance music. Powered by the Best Service Engine 2 software, this single instrument provides the sounds of a handcrafted wooden melodica with three registers. The instrument features three kinds of bellow shake, three different dynamics, three round-robins, and realistic button and key noise performances. The instrument was meticulously recorded chromatically with the pristine sound of a U47 microphone. Note: This single instrument was exclusively designed for Best Service Engine 2 and is not compatible with Kontakt Player.